Why do you need an audio interface? Can’t you record your instruments using the built-in sound card? Of course, the answer to this question is a bit more complicated than standard yes or no. Technically speaking a sound card is an audio interface, but it has worse sound quality than an audio interface and is limited in a number of audio inputs and outputs. Most sound cards offer only 3.5 mm microphone and headphone jack. The other things that can degrade the sound recording quality are latency, vibrations, or radio interference. Sound cards are good when you need to connect Hi-Fi speakers and play compress audio, but if you are serious about recording music, you need an audio interface that offers good sound quality and additional types of inputs for connecting instruments and microphones. Behringer UM2 offers a black and silver casing. What shouldn’t be surprising, is that at this price you won’t get a top-notch quality metal chassis. The audio interface is entirely made of plastic – there are no metal parts on the outside of the device. Chassis seems surprisingly well built with nothing feeling lose. The plastic knobs are located on the top, which is not a popular place in other audio interfaces, even those from Behringer, which are located on the front. Probably Behringer wanted to keep the size of the device as compact as possible. This location seems to be a very intuitive place for the knobs, which are easily reached for adjustments. 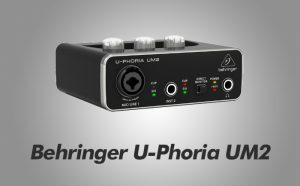 The Behringer UM2 is designed with the portability in mind. But remember that it’s plastic, so you should treat it with a proper care. 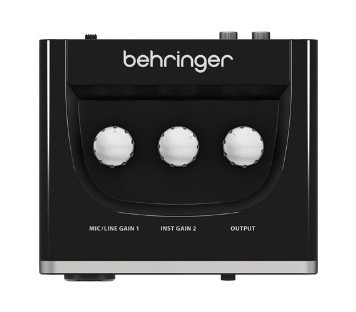 The Behringer UM2 offers two inputs on the front. One of them is an XLR / TRS ¼ inch (6.35 mm) combo, and the second connector is ¼ inch (6.35 mm). The XLR connector is used to connect a professional microphone, a TRS for electronic instruments, such as keyboards, bass guitars or electronic drums. Each input has two associated LEDs on the front panel, which are located to the right of them. The green one indicates that a signal has been detected and the red one shows when the signal is clipping. There are two other LEDs. The orange one tells you whether the device is on, and the red one, called +48 V indicates whether the Phantom Power is on. Phantom Power is used to power the dynamic or condenser microphone. On the right side of the front panel, there is a headphone jack for monitoring. The normal signal goes from a microphone to an interface through USB, to your software and back. This creates latency. To avoid this, you can use the direct monitor button. It gives you a signal directly from a microphone, so if you are recording with a software there is almost zero delay. On the back, there are two RCA analog outputs and the switch to turn on/off the Phantom Power. It’s powered through USB, so you just plug it into a computer and don’t have to use any other source of power. Just plug your microphone and instrument and record right away. The UM2 interface is a low latency device, which is surprising. It’s very important for someone who records a lot of vocals and guitars. At this price point, you can’t beat Behringer in terms of recording quality and features. But there is something that I feel is going to be a major disadvantage, that other devices (also from Behringer) don’t have, namely the UM2 is limited to 16-bit / 44 kHz, which is ok for streamers and podcasters, but a serious musician should look for 24-bit devices (Scarlett Solo vs Behringer UM2). The higher 24-bit device is required if you want to listen to the samples in your DAW with much more depth, and there are noticeable differences compared to 16-bit interfaces. Overall the UM2 interface sounds clear and the gain levels, thanks to clipping indication, are under control. Normally the headphone outs on low-cost devices are cheaply made and underpowered, but in UM2 the headphone amp is quite loud. It would be great if there was a separate knob where you could control the volume control of the headphones. If you really need this, you have to pay at least twice as much for UMC202HD. If you want to set up the UM2 on a Mac, you can just plug it in. You don’t have to install any drivers. On Windows, it’s a bit more complicated. You have to download and install a free 3rd party driver called ASIO4ALL. It’s a hardware independent ASIO driver for WDM audio devices. When you buy an audio interface, it usually comes with an included DAW. In this case is the lite version of Tracktion. But it’s not included in the box. You have to register the product with Behringer to get your download code for Tracktion. PROS: Affordable / Decent plastic chassis / Phantom power / Direct monitoring / Comes with an included software / Loud headphone volume. CONS: Only 16-bit/48 kHz playback. UM2 is a great audio interface for an amateur musician, podcaster, or streamer. It’s cheap, light and has a decent build quality. The biggest disadvantage is that it offers only 16-bit/48 kHz playback which is not enough for professional musicians. If you are serious about your musical career, you should choose something more powerful, such as Behringer UMC202HD or look at Focusrite devices (Behringer UM2 vs Scarlett Solo or Focusrite 2i2 vs 2i4).